A BBC radio presenter has told how she worked through cancer treatment because she wasn't eligible for sick pay after being taken off a staff contract. 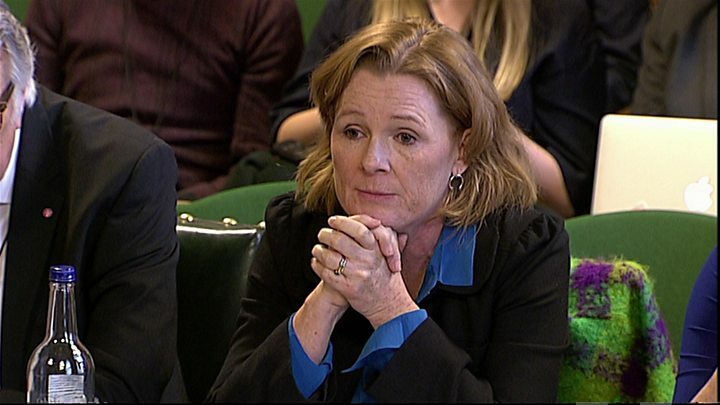 Kirsty Lang, who co-hosts BBC Radio 4's Front Row, has given evidence to a committee of MPs about how the BBC set up presenters' tax arrangements. Many say the BBC forced them into going freelance instead of being staff, so they didn't get benefits like sick pay. Lang told the committee she had been "hung out to dry" and "betrayed". She was one of four broadcasters who spoke to MPs on Tuesday. They said the BBC put pressure on presenters to be employed via a personal service company (PSC). Some are being investigated by HM Revenue & Customs and facing huge bills for unpaid tax. Lang was originally on a staff contract - but said that when she asked to go part-time after her son started having problems at school in 2013, she was told she could only do so if she went freelance. She said she "didn't really feel like I had a choice because of my family situation", and the arrangement was not a way for her to avoid paying tax. "Then, sure enough, all my worst fears came true. Not long after I went freelance, my stepdaughter died suddenly, and I was unable to take bereavement leave. "In fact, I went back and did the first show even before her funeral because I had to get some money in. Then, two years after that, I was diagnosed with cancer. "I had surgery, radiotherapy, chemotherapy, hormone therapy. I worked the whole way through. I took one month off at the end of chemo, actually." She said that about a year ago, she was told she would have to be paid via PAYE for tax purposes - but was told she still would not get sick pay or holiday pay, and was still without a contract. "None of us take pleasure in being here," she added. "I would rather have sorted this out with the BBC. I entered in to this in good faith. I trusted the BBC, I'm proud to be part of the BBC and I feel I've been hung out to dry, I feel betrayed. "I ask this - where is their duty of care towards me and my colleagues, because I speak for many, many people in this situation. "I have seen many women presenters being deprived of maternity leave. I have seen many colleagues deprived of sick pay. And we keep on doing it because we love the job." Lang was joined on the panel by 6 Music's Liz Kershaw, Radio 4 Money Box's Paul Lewis and Stuart Linnell from Radio Northampton. Lewis told the MPs the BBC had saved around £10m per year on National Insurance payments by paying presenters through personal companies. The committee's chairman Damian Collins MP said the BBC had fallen "well below" the standards expected in its treatment of staff and said he would demand answers from director general Lord Hall. He also said he was "disappointed" that no-one from BBC management had appeared in front of the committee. In a statement, the BBC said it recognised there were "issues to address" and had "always tried to balance our responsibilities to presenters with our responsibility to spend the licence fee appropriately". Image caption Samira Ahmed gave written evidence saying she felt "hugely bullied"
The corporation has now announced an independent dispute resolution process. It could lead to the BBC paying a share of historical bills, which in some cases run into thousands of pounds. Other presenters gave their stories to the committee in written evidence. They included an unnamed female BBC local radio presenter who said she tried to kill herself, partly because of the stress over her employment arrangements. She told the committee she was "forced" to set up a PSC in 2011 - even though she lost out financially as a result. She said she was later forced to work on three-month contracts with "no sick pay, no holiday, no permanent contract" opposite a better-paid male staff member who had such benefits. "I have been paid too little due to the use of incorrect tax codes, been subject to clawback, received no information for months on end as to what I was going to live off," she said. "My mental health deterioration is absolutely linked to the increased stress of working for the BBC. "I have always loved working for the BBC but the way they have behaved has reduced me to more than tears. It's one of the factors that three days ago took me into my loft where I tried to hang myself." Another unnamed presenter said: "My physical and mental health has suffered and the quality of life with my young family has been impacted. In the darkest of days and the spectre of retrospective action from HMRC hanging over me daily, I contemplated taking my own life." TV and radio presenter Samira Ahmed also gave evidence ahead of the hearing, saying she felt "hugely bullied" over her employment status. Mr Collins said the accounts were "highly disturbing". He said: "By allegedly being coerced into these contracts, these individuals may have been denied employment rights, and some face liability for huge tax bills. "This evidence indicates that the BBC is falling well below the standards we would expect in terms of how it treats its staff." Presenters will now be able to ask for a review of their cases through the Centre for Effective Dispute Resolution. The process will consider whether it is "appropriate or reasonable" for the BBC to make a contribution towards historic demands for employers' National Insurance.